It’s Guest Blog Wednesday featuring Alex Garcia! Do your pictures speak to you? If you’re feeling a dry spell in your creativity or you’re undecided about what personal project might wow your next client, it’s a curious but valuable question. What happens often as photographers is we get caught up in tools of the trade. Not everyone obviously, but with so many eye-popping advances in technology we drift towards how we can manipulate, control and shape our images. We tell our pictures what to say. It makes perfect sense. If you’re trying to stay ahead, so much has to measure up. Who wants to take chances with pictures when a client’s expectations are at stake? More control, less risk. So we previsualize, research, come up with shot lists, use photo actions and tools. With a flourish of creativity, we finish. The results can be beautiful. Editors and art buyers want to be surprised by someone’s individual passions and creativity. They want to lasso a star. If you feel like you’re producing well-crafted widgets with your photography, or if you’re casting about for a personal project to get your passions going on, let me make a suggestion that I try to follow myself. What the heck do I mean? I’ve been a photojournalist for over twenty years, and I’ve done a lot of conscious picture-taking. Before I compose a picture, I’m thinking of my subject, my audience, my editors, and the reporter’s story. I’m trying to find and make pictures that will sing in the space provided but within the constraints of expectations and needs of the job. So, tired by all the control I was exerting, I decided to do the thing that I kept putting off. I decided to explore my family roots in Cuba…without pictures. What happened next set in motion a chain of events that forever changed my perceptions of photography and the direction of my career. Unlike everyone else who goes to Cuba, especially through numerous destination workshops, I didn’t want to take pictures and turn the island into a photo project. I didn’t go to take photos of cigars, cars and decrepit buildings like everyone else. I wanted to meet family that no one in my U.S. family had seen in about forty years. I took a camera, but more to take visual notes and to photograph family. Yet, every time I felt an emotional chord strike, I would take a picture and move on. It wasn’t an emotional family homecoming. That’s the stereotypical narrative for a returning family member. But too much time had passed. Politics intervened. My experience was a bit disjointed and sometimes awkward. I was troubled by my experience. I came back and put away my pictures for 6 months. But my unconscious had a few things to say. Still needing to process the experience, I went through and selected every picture that rang an emotional chord, even if I didn’t understand why. I was a stranger. It was also a strange land to me. I was a stranger in a strange land. Yeesh. So much for feeling closer to my family. Fast forward years later, I found myself at the presidential palace, face-to-face with Cuban President Fidel Castro. After what my pictures said on my first trip, I responded. I kept returning to the island, ultimately risking a staff job at the Los Angeles Times to ask for a leave of absence to study in Cuba for six months. After the L.A. Times, I came to the Chicago Tribune, with extensive Cuba experience. Shortly after, the Tribune was the first U.S. newspaper in forty years to receive permission to open a bureau on the island. I jumped into my editor's office. He could sense my passion. So there I was at the presidential palace, getting ready to photograph our CEO and the Cuban president, shaking hands at the inauguration of the bureau. On that trip, that lasted a couple months, I produced a sports picture essay that won a World Press Photo award. That award led to book projects and other opportunities. I’ve left newspapering since then, but it was still a personal and professional highpoint in my career that is still bearing fruit. But it all started with exploring a personal interest that, honestly, was unsettling. While at the Tribune, I wrote a weekly column about photography that was gathered into my recent book Depth of Field: Tips on Photojournalism and Creativity. I write about personal projects and the psychology of picture-taking because our unconscious behavior is either helping or hindering us. But when you do, and respond, it could add a missing personal dimension to your photography that others are hungry to see. 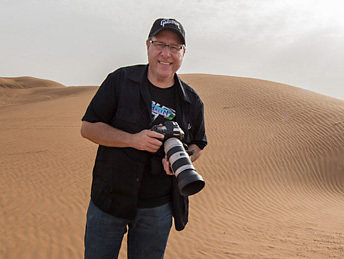 Alex Garcia is a Chicago-based editorial and commercial photographer with over twenty years experience as a photojournalist at the Los Angeles Times and the Chicago Tribune. He is a frequent lecturer, author and public speaker. His recent book is “Depth of Field: Tips on Photojournalism and Creativity.” You can see more of his work at AlexanderGarcia.com, and follow him on Twitter and Instagram. Really inspiring advice! Thanks for sharing, Alex! Inspired by your work in Cuba.